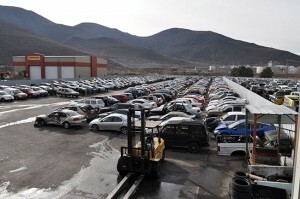 Because salvage vehicles have hundreds of parts that can be recycled, statistics for auto recycling can add up quickly. If you have doubts about the popularity or environmental impact of automotive recycling, these numbers may help to provide some help. End-of life cars are the most frequently recycled consumer product worldwide. Over 27 MILLION tons of materials from old automobiles are recycled annually. Car recycling is the 16th largest U.S. industry, contributing $25 billion to the annual GDP. Cars are the MOST recycled U.S. product, with 12 million units recycled annually. U.S. auto recycling saves 25 million barrels of oil from use for new car products annually. U.S. auto recycling supplies 40 percent of ferrous metal for scrap processing industry. U.S. car recycling yields over 35 percent of ferrous metal to blast furnaces and smelters. Tire recycling literally produces tons of material all the way from making a safe playground base to the building of roadways. Even when you learn the statistical importance of recycling a vehicle, many drivers of end-of-life vehicles are unaware of how to initiate the auto recycling process. So if your involved in an accident or just want to recycle your 2005 or later vehicle. Go to our website at NNAWG.com for the phone number to one of our 4 stores in the Reno/Sparks/Tahoe area that would be glad to help you recycle your vehicle. You can be confident that we will reuse what we can, and properly recycle the rest.